What is both surprising and unsurprising about Liverpool’s season ahead is that they’d do well to finish fifth, a position they’d have clinched last season had it not been for a downward slide towards the end. A number that would read marginally better than last season’s finish, but would still fall short of a Champions League place. A prediction shared by almost all pundits alike, despite promising signs of this season’s squad scoring more, conceding less. Not top four, therefore, irrelevant. There were more questions raised, than answers received following Liverpool’s forgettable visit to Stoke City last season. An embarrassing 6-1 score line aside, the infamous Sterling saga, heavy transfer spending, backroom sackings, and a daunting away fixture list constitute a cocktail of issues that are likely to decide Brendan Rodgers’ future if things don’t go as per plan. The long, laundry lists of preseason epitaphs did little to convince doubters that the following season would be better. On the bright side, Rodgers would argue, Liverpool were still relevant enough to attract the likes of Roberto Firmino, a player who’s ability more than fills in for Sterling’s loss and Nathaniel Clyne, England’s soon-t0-be first choice Right Back. The transfer window as a whole otherwise, in short, has been a mixed bag. Joe Gomez, following an impressive pre-season looks a bargain at 3 million, whereas the price tag hanging around Benteke’s neck, for no fault of his, would add pressure to a frontline, always in the midst of Sturridge’s fitness rants, that lacked confidence and composure in front of goal last season. Goals aside, Liverpool’s defence has hardly had the revamp that would match the unparalleled meanness of champions defending their goal. 2013/14 was a season where a poor defence was lost in significance to one of Europe’s best attacking units. 2014/15, after the sale of Suarez, and the loss of Sturridge, for most part, due to injury, bought to surface the issues that had already been perennial during the seasons preceding. Controversial as this may sound, let us face it. Jordan Henderson is a good player. A very good player. He’s an engine that can run for 90 minutes, or 120 minutes. Heck, he’d run from the halfway line to take a penalty if the game goes to the very end. He makes the occasional incisive pass, presses well. He behaves well both on and off the field. He is level-headed, dedicated, committed, a good student – ticking most of the qualities one would expect in a Liverpool captain. Henderson, now 25, is the full time captain of Liverpool FC, far away from any distractions surrounding the man he replaced, who is now plying his trade thousands of miles away in a league irrelevant to Europe as baseball is to cricket. But Steven Gerrard, at the same age, had led Liverpool to Champions League glory in Istanbul, was coveted by Real Madrid and Chelsea for world record transfer fees, whilst being described by Zidane as the most complete midfielder ever. Henderson, despite making significant strides in improvement, isn’t a name that would offer opposing managers headaches. There isn’t any other midfield in the top 4 of any league he’d walk in to, not to demean his status, but to merely state that being very good doesn’t warrant a place in the XI. This facet, in particular, has more to do with a Liverpool captain, than Henderson himself. Henderson lacks the composure that define great midfielders. His tactical awareness, at best, is average, while his passing under pressure still raises questions. His performances against big clubs (and England) add fuel to this theory. 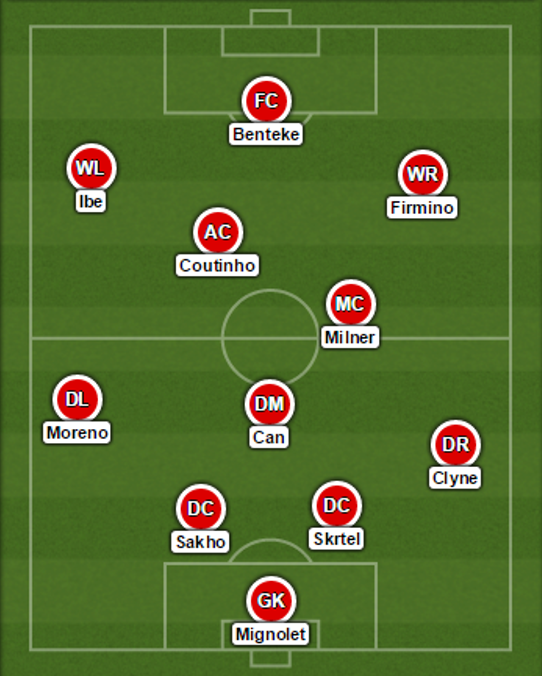 If Liverpool play a 4 – 3 – 3 or a 4 – 2 – 3 – 1, Milner, Can and Coutinho warrant those three places in midfield ahead of Henderson for the various qualities they possess, as a unit. Henderon’s qualities overlap with that of Milner’s. They are too similar to feature in the same XI. Before you think why these points spiral towards negativity, it is important to assess if any of Sakho, Lovren or Skrtel would walk in to the XI of any other top 4 club in Europe. Skrtel has been walking the tightrope for a few seasons now, while Lovren has made us wonder what was wrong with Toure at all. Toure’s theatricals at Fulham two seasons ago is now a forgotten memory. Djimi Traore rises to significance in comparison. Lovren did little during the preseason to convince his doubters wrong. Sakho’s periodic appearances point more towards Rodgers’ lack of trust in the Frenchman, than his own performances. Skrtel still remains the most obvious choice by a distant, despite his many misgivings. With no defensive midfielder as a reliable shield in front of them, there’s little reassurance that Liverpool won’t ship more goals than their top 4 competitors this season. Did Liverpool miss a trick in not signing a proven center back (again?)? Or a defensive shield in the mould of Gary Medel? Jamie Carragher was surprised by Liverpool’s lack of intent in signing a defensive midfielder. Reports linking Liverpool to Gary Medel was encouraging, and made sense. Medel, like most Chileans, is technically sound, tactically intelligent. He is a destroyer, one who can operate as a Ball Winning Midfielder, or a Ball Playing Center Back. The moment was right to make a bid for him, especially with Inter signing Kongdobia. That Medel has premier league experience – a solitary season with Cardiff – would have been of immense value. And Medel would have made Lovren and Sakho look better. The backroom reshuffle, unconvincing as the explanations were early summer, has one stark feature in store: if coached well, Liverpool fans can expect technical, eye-catching football from a squad that has talent in abundance up front. While Coutinho and Firmino carry Brazilian flair, Adam Lallana, with plenty to prove this season, is probably the most Spanish of English players in the league. When coupled with the raw talents of Ibe and Markovic in the wings and a fit Sturridge upfront, the slick passing and movement that the 2013/14 season showcased could be at display again. Liverpool’s inability to flourish when put under pressure, in tight spaces, was evident during many a game last season. But the revamped coaching staff, on paper and theory, live by the mantras of tactical training. Steven Gerrard confesses that he’d become a better player since Gary MacAllister turned up in Liverpool colours at the age of 35. Gary Mac, he says in his autobiography, could stop a training session, offer his opinion and everyone, including the coaches, would be all ears. As a full time coach, MacAllister can carry a greater influence amongst the younger crop alongside Sean O’Driscoll to exert the style and technique required to exhibit such football. Remove the deadwood before it turns in to Adebayor. Some of the investments made in players during the Rodgers era were plain disaster – some on par with Houllier’s forgettable signings of Diouf, Diao and Cheyrou. Borini, Balotelli, and Jose Enrique have been told to find other clubs, while the presence of Allen, who has hardly convinced fans, forget sceptics, over three seasons can count himself very, very fortunate to be among those still being rated by Rodgers. His preseason form did little to justify his place in a match day squad, and an injury has only removed any hope of another club availing his services before the window closes. Letting their contracts runs through the Adebayor way would do the club, nor the player, any favours. Lucas Leiva was subject to interest from Italy, but with nothing materializing, he is hardly the defensive screen Liverpool need. Fans would argue that statistics mention that Liverpool have performed better with Lucas in the team. Before we make soap boxes out of stats, it is evident Lucas isn’t the force he once was. His tactical intelligence is of no doubt, his mobility and pace, although, is. Liverpool are in dire need of a midfield presence – one who can break attacks, and in layman terms, do the dirty job. Matic, Coquelin, Fernandinho (to an extent) have shown their influence in the role for their clubs, whereas Liverpool haven’t had a genuine one since the days of Masceranho. Which resurfaces the Medel miss again. A tame away performance against Besiktas last season saw Liverpool miss out on a chance to progress in a competition where they might have stood a chance to win as long as they’d stayed in it. There is enough squad cover to compete and put a show in multiple competitions. Liverpool stand a better chance of qualifying to the Champions League by winning the Europa league next season, than finishing in the top 4. One of the Manchester clubs would have to slip to entertain such a thought.